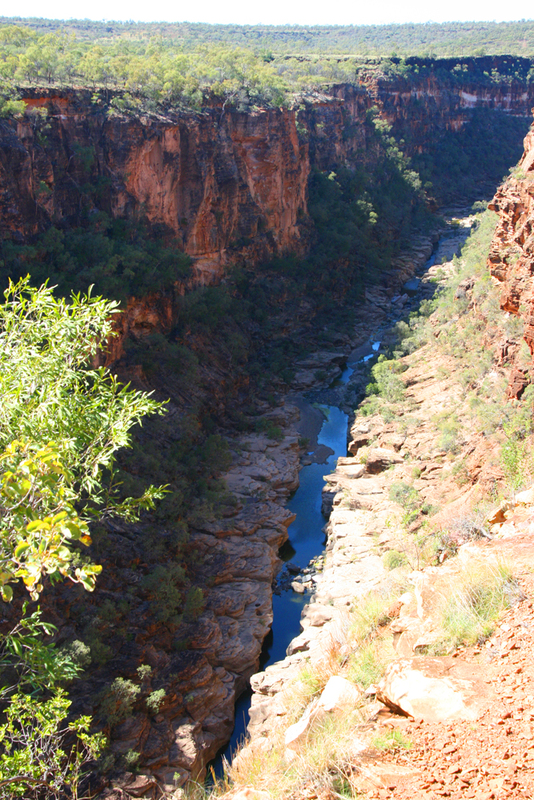 Porcupine Gorge has been formed by Porcupine Creek carving this impressive canyon over hundreds of millions of years. 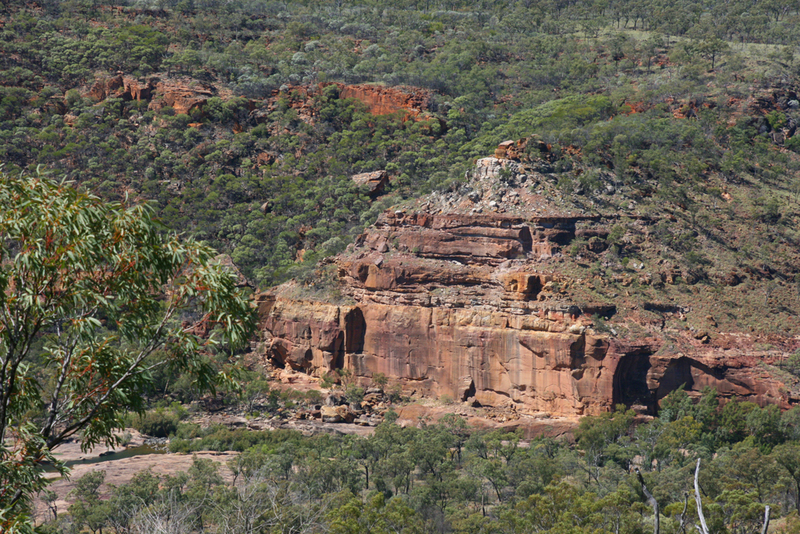 It is easy to see the layers of Basalt, Mudstone, Conglomerate, Dark Sanstone and at the base of the gorge the White Sandstone. From the lookout you get a great view and a feel of just how deep the gorge is, which is approx. 120 metres. 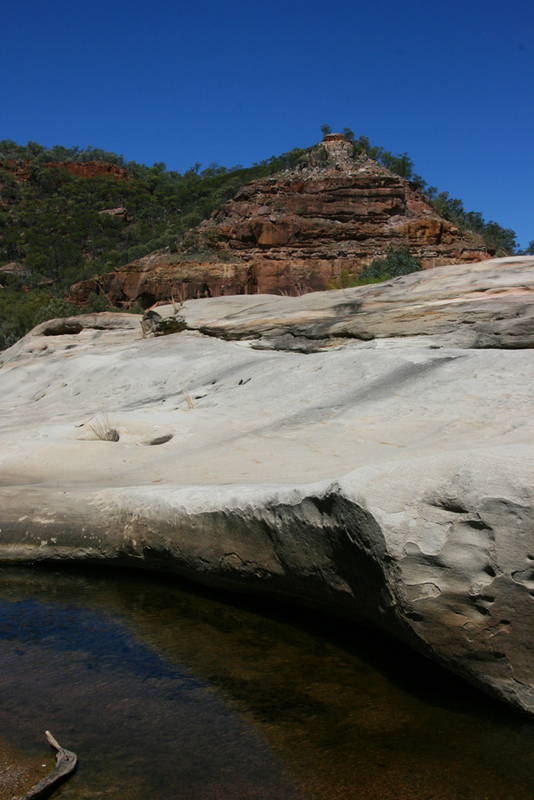 In the widest section of the gorge, the eroding action of the creek has created the Pyramid, an isolated monolith of multicoloured sandstone rising from the floor of the gorge. 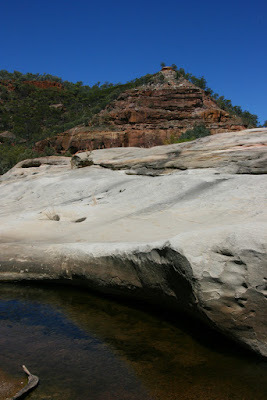 There was also a 2.4km walk from the rim to the sandstone bottom and silly me decided to do the walk. The information brochure said " Grade: Medium". Ha what a laugh! 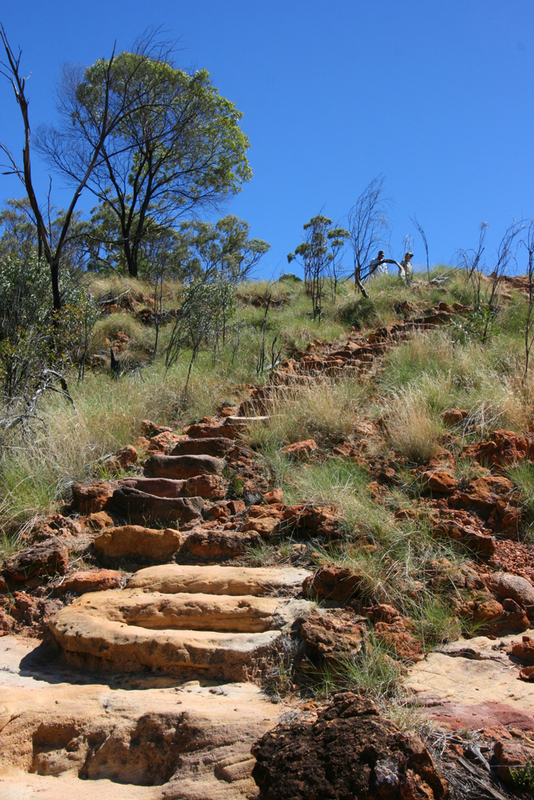 Walking down wasn't to bad but it was probably 90% rock steps. The Porcupine Creek was still flowing, only with a small amount of water. 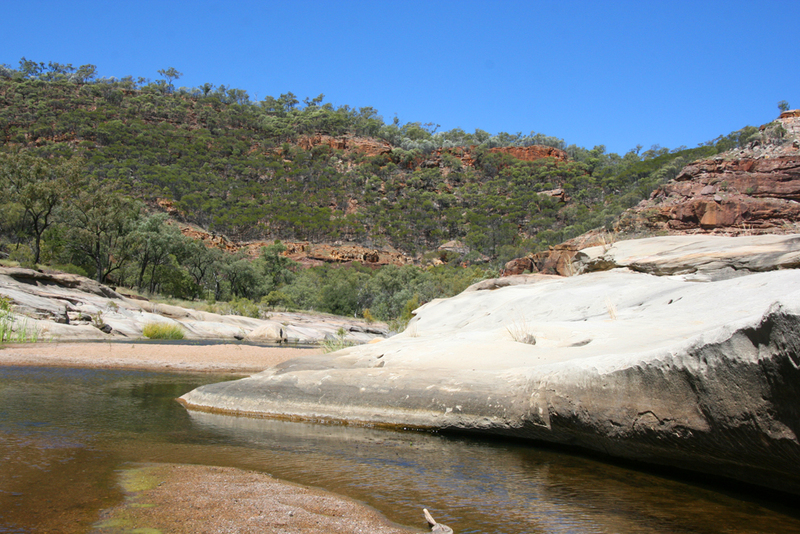 It was quite pretty with the different colours of the rocks and the waterholes that still remained as the water level dropped. But I knew I was going have to tackle all those steps going back up the hill. I took my shoes off and cooled down my feet in the flowing creek, then several times I scooped up water in my hat and tipped it over my head in preparation for my climb. Oh my it was very difficult, I had to really motivate myself all the way up. But I know one thing for sure - I DON'T ever want to do that climb ever again, ever. I am very proud of myself for doing it, but I still don't want to do it EVER again!!! Along the drive to the National Park there were a couple of interesting things to look at. 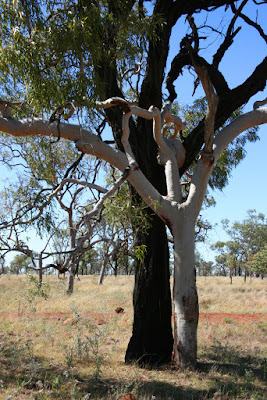 Close to the road edge was what has been named "Ebony and Ivory" - two entwined trees, one black, one white. 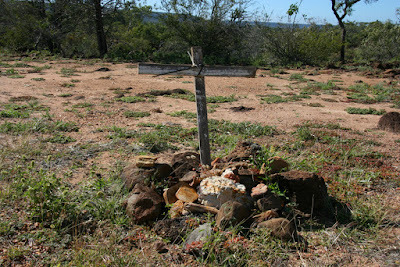 from the top of the hill. He was buried where he was found. Unmarked Grave - there are two stories being told about this tiny grave. 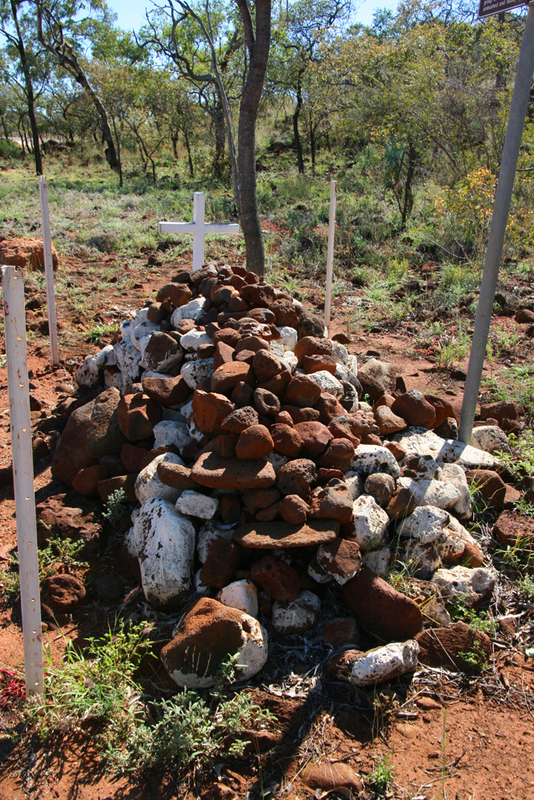 One is that the grave is that of an old Chinese man found dead along this road and the second is that the grave is that of an Aboriginal girl named Minnie Waite who perished either by foul means or of exposure when trying to walk to Hughenden some 52 kms away.